Right: The former Spanish and Portuguese Synagogue (now the Manchester Jewish Museum), designed by Edward Salomons (1828-1906) and built in 1873-74. Left: Detailing on the façade of this Grade II* listed building. 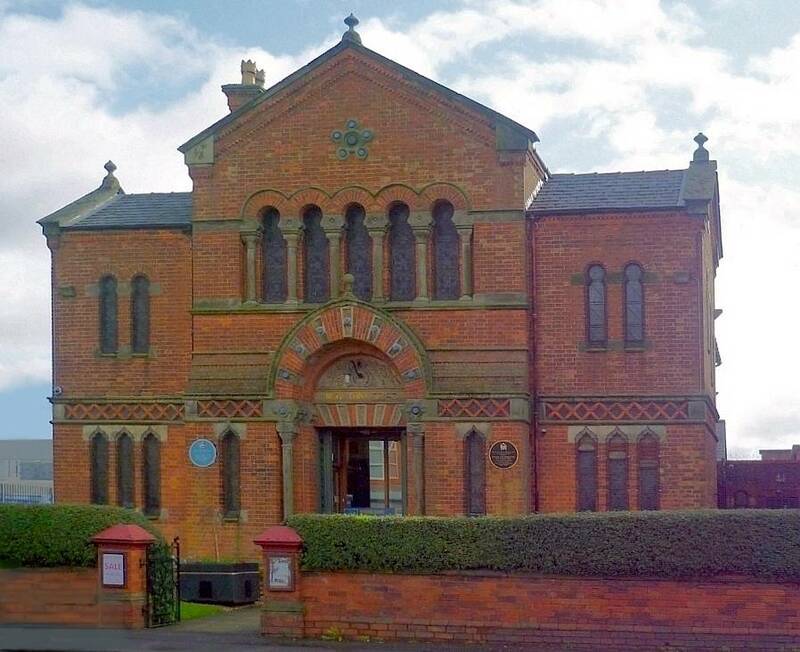 Built of red brick with sandstone dressings and slate roofs, the synagogue stands on Cheetham Hill Road. This is in the southern part of Manchester, where many better-off Jews settled to escape the hum and pollution of the growing industrial city below them. The building is T-shaped, with a gabled façade fronting the main hall of the synagogue, and two sideways gabled wings — these housing the ends of the vestibule area with its small rooms, and (on the right) the stairs up to the galleries. The top row of five large horseshoe-shaped windows on the projecting front bay is especially effective. It is echoed by the two similarly shaped smaller windows on each wing. All the lower windows have contrasting ogee heads. As usual with this architect, there is detailed decoration on the façade, with banding, diaper-work, and stone carving, both foliate and geometrical, both inset and raised. The round blue-grey "studs" over the Moorish entrance arch and in the cinquefoil at the very top also catch the eye. The whole is distinctive, quite different in style from either a church or a classical temple, and appropriate for its congregation of Sephardic Jews — descendants of those who were driven out of Spain and Portugal in the late fifteenth century, many of them then settling in the middle east. 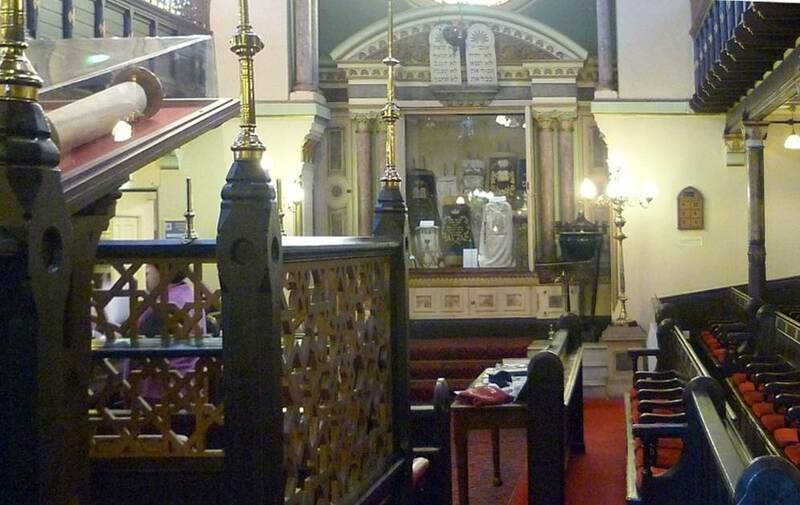 Left to right: (a) Interior, looking along towards the Ark from the right side of the Bimah. 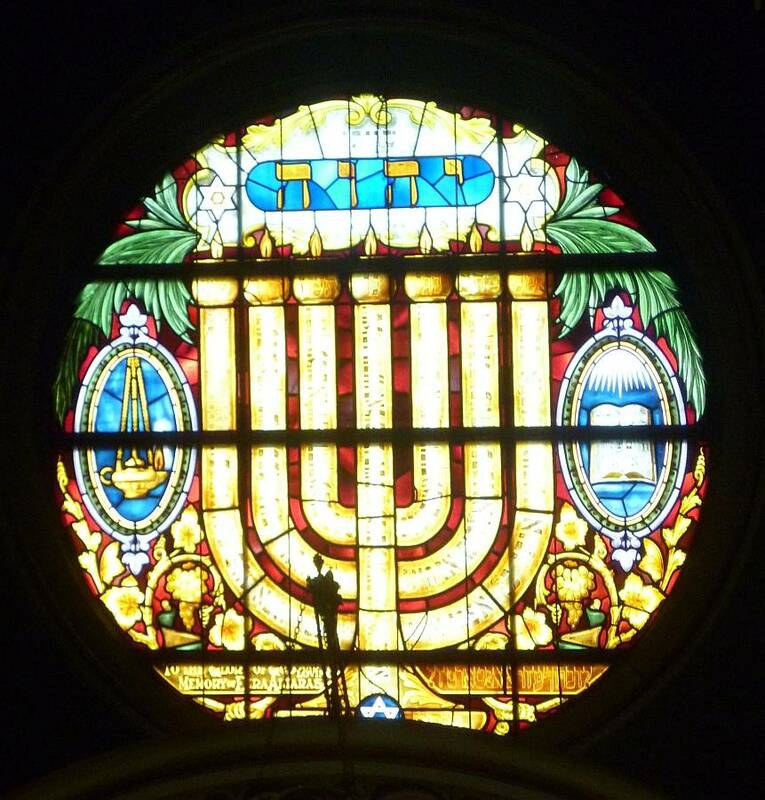 (b) The east window with its splendid menorah dating from 1913 (see Hartwell 303). (c) Looking upwards at the delicate ironwork of the gallery fronts, and the exposed timbers of the roof. Notice the sets of pink marble columns and the attractive Moorish arch around the Ark. 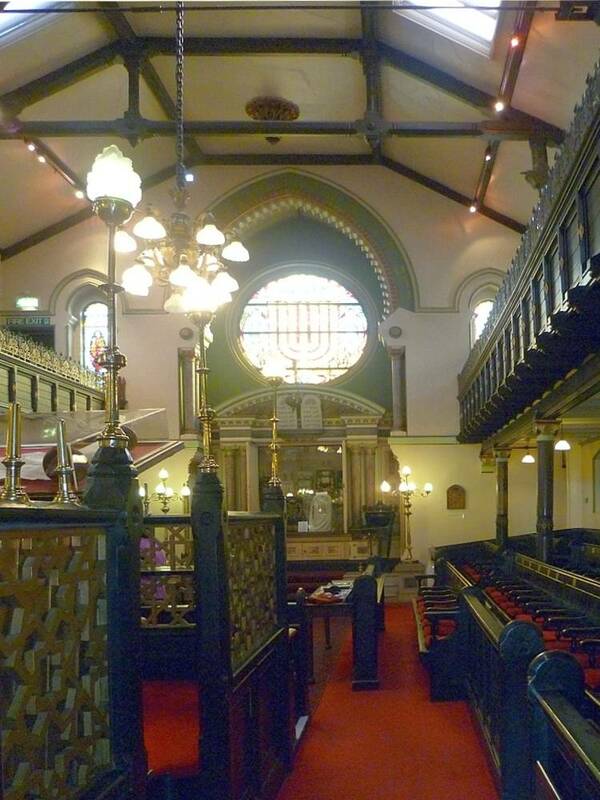 Although the synagogue is now used as a museum, the original colour scheme and the gilding have been restored, and the heavy benches too are original (see Hartwell 302). It is a well-lit building. 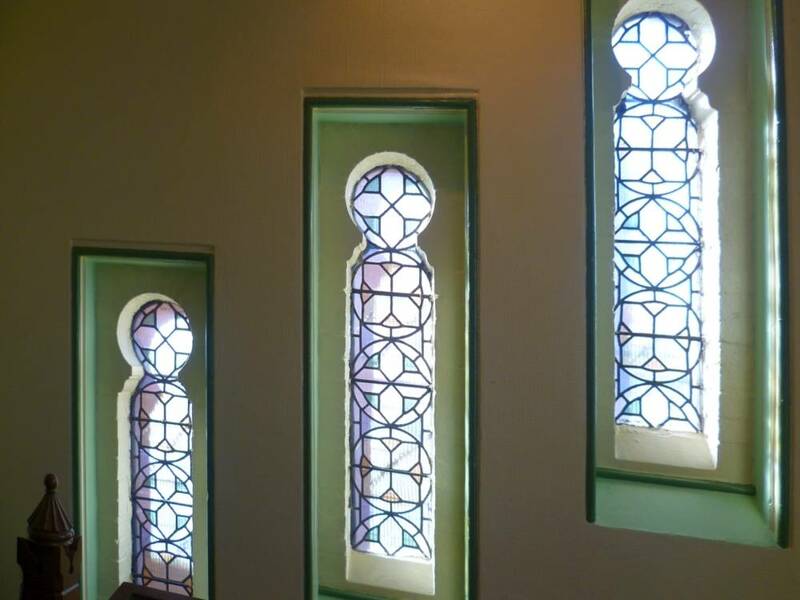 As the listing text explains, "The side walls of the main range have low plain segmental-headed windows at ground floor and circular windows above, mostly with stained glass." 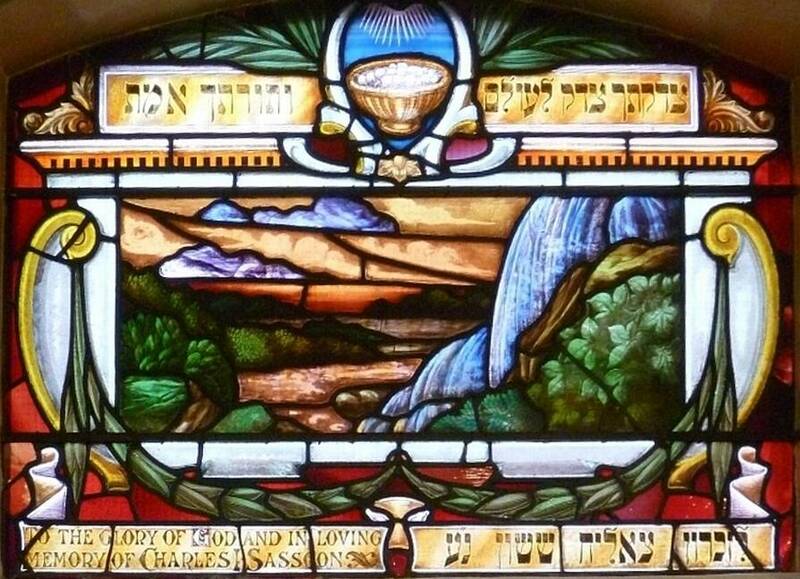 Most of this boldly designed and richly coloured stained glass was put in during the very early twentieth century. 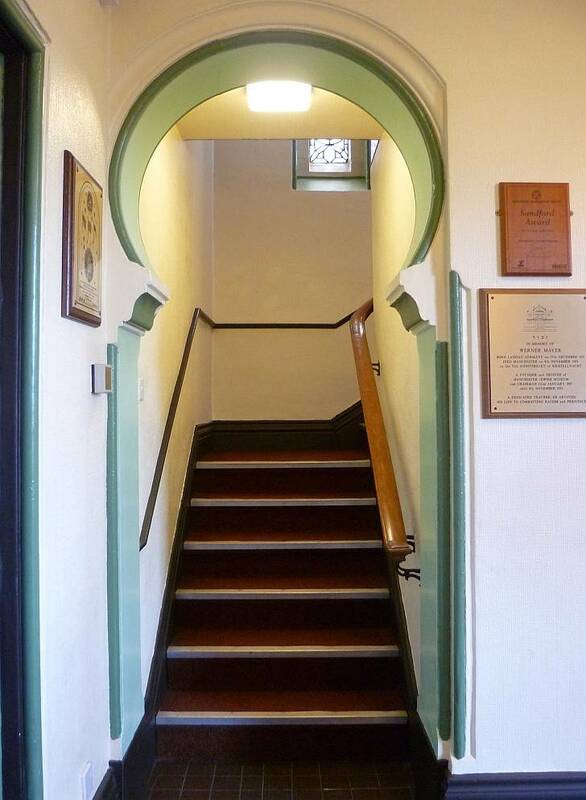 Left to right: (a) Attractive horseshoe-shaped entrance to the stairwell. (b) Staggered windows on the stairwell. (c) A view down from the Ladies' Gallery. Salomons himself described his style here as "'Saracenic' and 'Moresque'" (Hartwell 301), and features of this style can be found throughout. 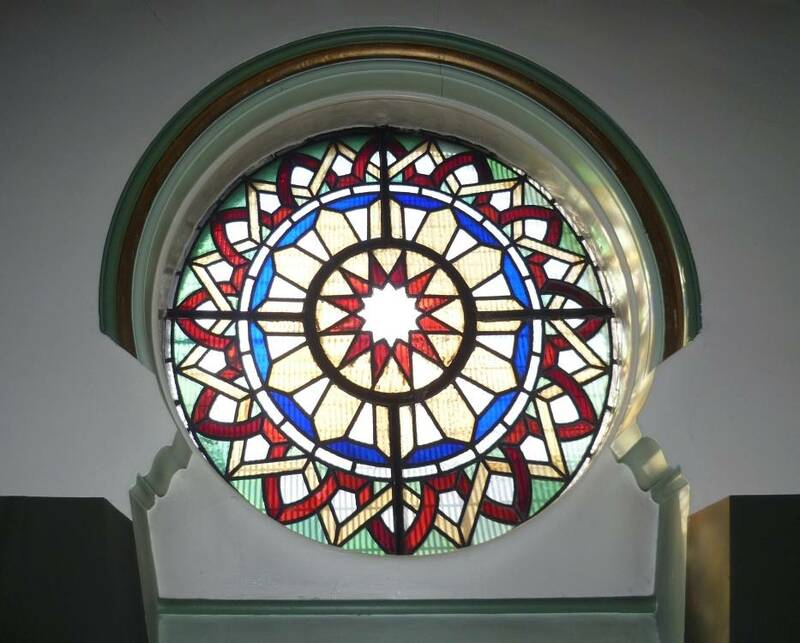 Left to right: (a) One of the round windows with geometric designs. (b) Upstairs window showing "The Pillar of Clouds." (c) A downstairs window "in memory of the first president and a founder of this congregation and his good wife." The window shown in the middle is one of a pair at opposite sides of the east end, illustrating Exodus 13, 21: "And the Lord went before them by day in a pillar of a cloud, to lead them the way; and by night in a pillar of fire to give them light; to go by day and night" — the matching window illustrates "The Pillar of Fire." The downstairs windows also show specific scenes from the Old Testament. As Clare Hartwell suggests, these windows all seem to be "by the same hand," but unfortunately we do not know whose. 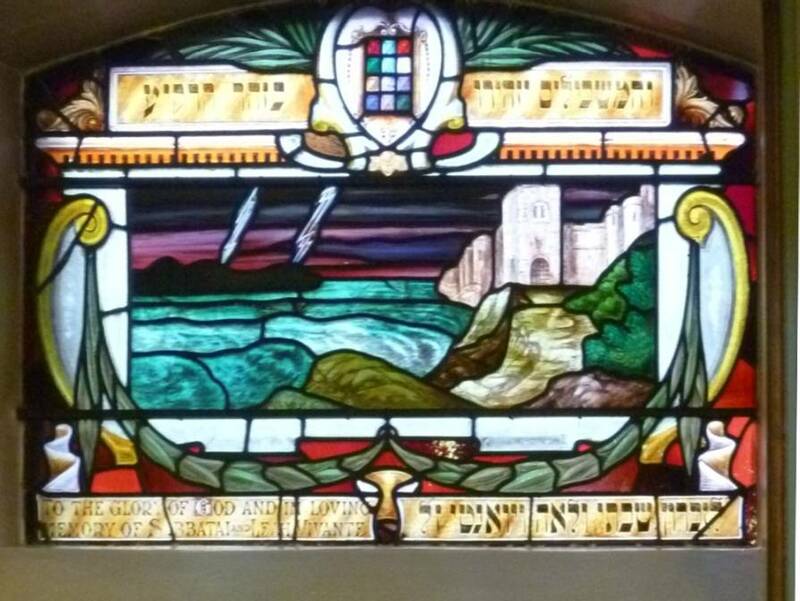 More early twentieth-century windows in memory of members of the congregation. 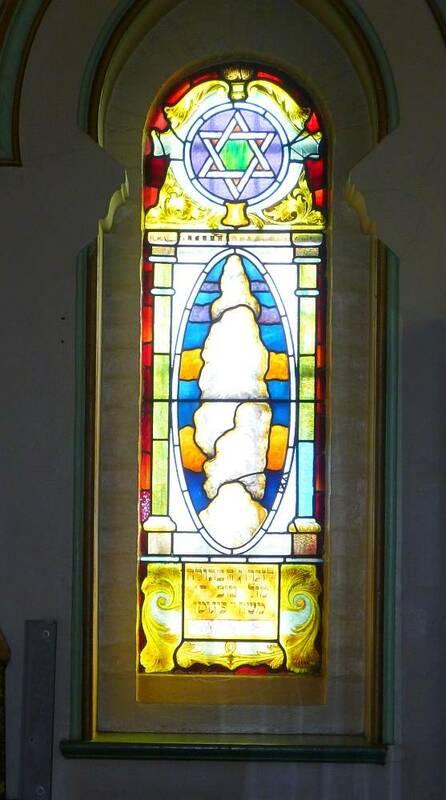 Left to right: (a) Window in memory of Abraham Hamwee. (b) Window in memory of Sabbatai and Leah Vivante. 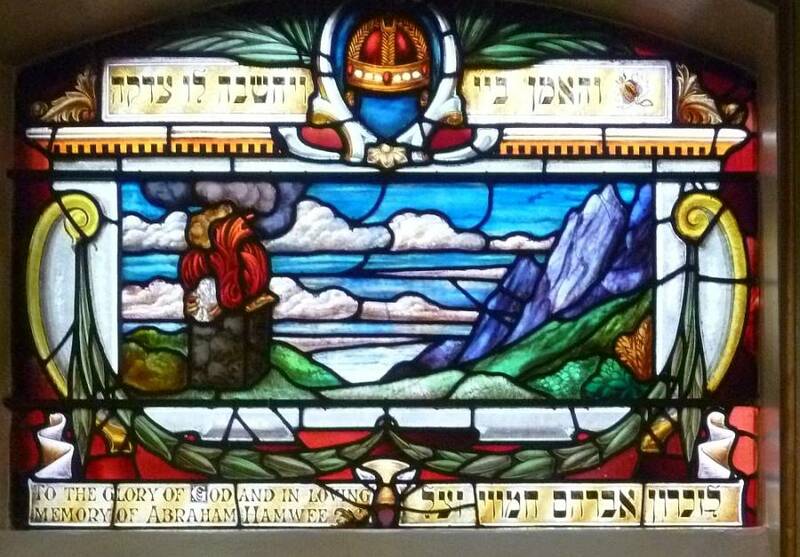 (c) Window in memory of Charles I. Sassoon. Those thus remembered have, of course, Sephardi surnames. Charles I. Sassoon, for example, is very likely to have been Charles Isaac Sassoon, a Baghdadian merchant who came to England and was naturalised in 1882, dying in Manchester in 1906 (as listed by Collins 7). 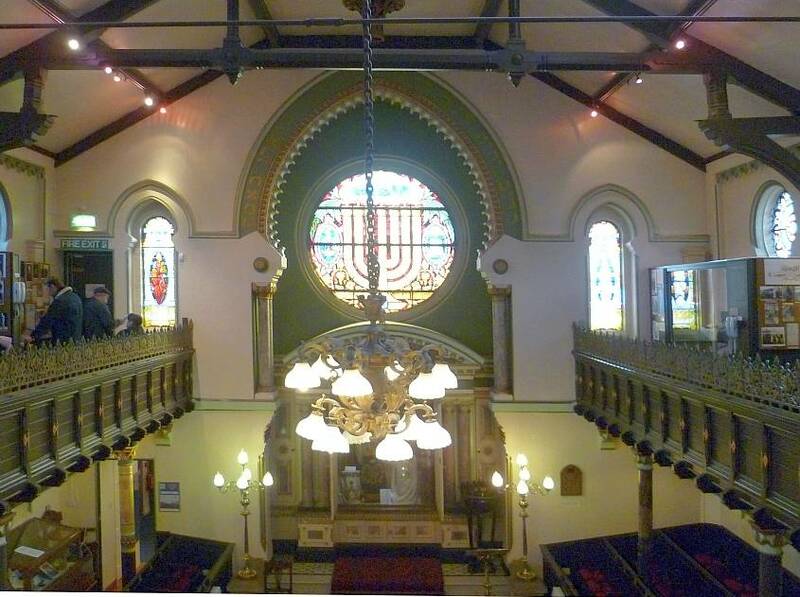 Many of the individuals who attended the synagogue may go unrecorded in history, but during the Victorian period the Sephardim as a group were finding their place "among the elite of Manchester Jewry alongside veteran residents descended [like the architect Salomons himself] from older Anglo-Jewish or from German immigrants" (Zeemer 142). 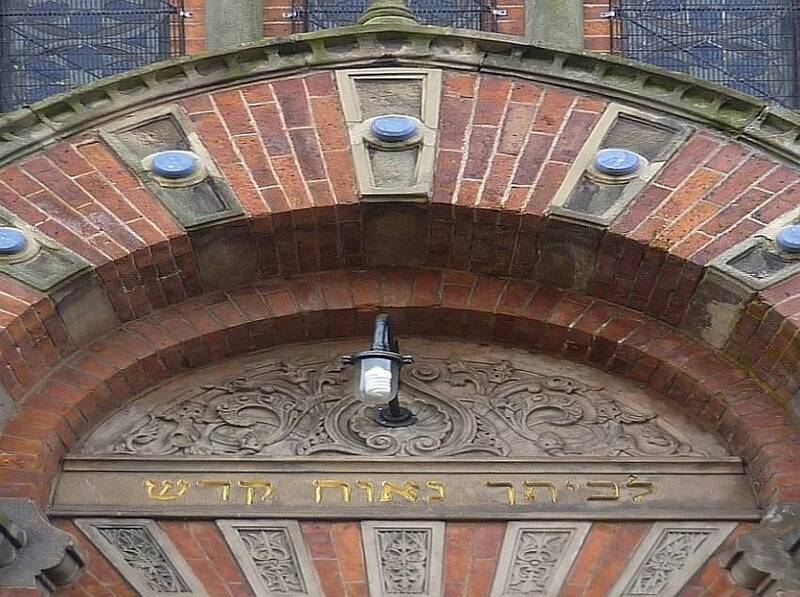 By now, in fact, there were so many well-to-do and also cultivated and philanthropic Jewish residents in Manchester that theirs was becoming, if it was not already, "the largest, and perhaps the most influential, Jewish community in provincial England" (Williams vii). "Influence of the Middle East: Moorish, Saracenic, Northern Indian, and Islamic Design"
Collins, Lydia. "Early Baghdadian Merchants in Manchester." The Scribe. Issue 57, p.7. Web. 3 October 2012. Manchester Jewish Museum, Manchester. British Listed Buildings. Web. 3 October 2012. Williams, Bill. 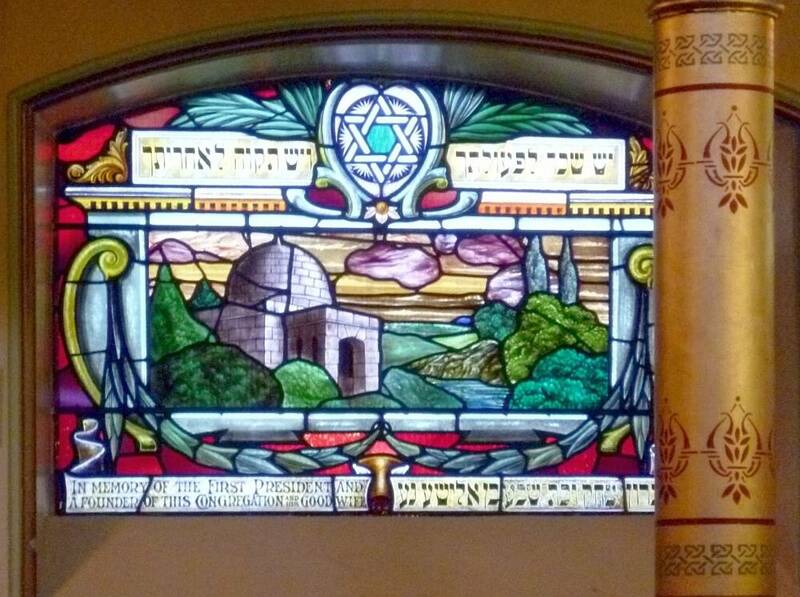 The Making of Manchester Jewry. Manchester: Manchester University Press, 1985. Print. Zeemer, Walter P. "Streams of Immigration: Sephardic Immigration to Britain and the United States." From Iberia to Diaspora: Studies in Sephardic History and Culture. Ed. Yedida K. Stillman and Norman A. Stillman. Leiden: Brill, 1999. 139-150. Available for preview on Google Books. Web. 3 October 2012.